The in basket: With Fifth Street in Bremerton closed at Washington Avenue and its pavement crushed, plus the north end of the barrier separating the two levels of Washington between Sixth Street and the Manette Bridge newly shortened, I wondered if the city was doing work to prepare for this summer’s realignment of Washington, or if it was the first phases of the project itself. It seems that the start of street and road projects have a way of dragging into the late summer and I hadn’t heard that the contractor had been given the go-ahead to begin the overall project, which will reduce Washington to a single lane in each direction with bike lanes and wider sidewalks between Sixth and the bridge. I recall that years ago, a Road Warrior reader suggested that the toe of that barrier be cut back or at least painted white so left-turn traffic coming off the bridge was less likely to turn too sharply and hit it. I don’t recall what I did with that, but it didn’t get done then. pleted in November. 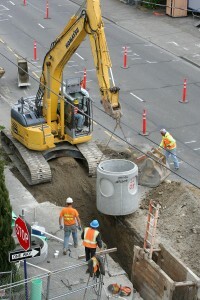 The closure of Fifth Street is for utility improvements that are working their way up to Sixth Street. Fifth is scheduled to reopen on May 11, but then Sixth Street’s intersection will close. That will be a much bigger deal, and City Engineer Tom Knuckey said a detour plan will be announced soon. Sixth is to reopen May 14, then Fifth will close again while the utility work is tested. All the work will occur Mondays through Thursdays, the schedule says, as the contractor has chosen to work four 10-hour shifts, at least to start. Soon the traffic signal at the end of the Manette Bridge will begin flashing red continuously for 30 days, a precursor to installation of stop signs to control the intersection for the duration of the project. The signals will go back into operation when it’s complete. The current city staff has no recollection of the previous suggestion to cut back or paint the toe of the barrier, which isn’t surprising. It was a long time ago and I’m not sure anyone has actually hit it while turning. Chal Martin said it has been done now because reducing Washington to a single lane will make the turn tighter. In practice, most drivers have swung out into the outside lane when turning left off the bridge, he said. That’s technically illegal (drivers are required to turn into the nearest available lane when turning into a roadway) but it is what has been happening. Left turners no longer will be able to swing as wide when the project is done, and construction equipment also will benefit from the shortening. The other end of the barrier will also be cut back to aid left turners from Sixth onto Washington – and the construction vehicles during the work, Tom said. The out basket: The signs actually say a right turn only is permitted, with an arrow, but with a second sign, “Except Bikes” just below. They are on both Fourth and Fifth streets on both sides of Warren. I asked Gunnar if a left turn by a bicyclist passing through the median barrier would be permitted, and he said he believes that would be permitted. I also asked if any kind of motorized two-wheeler, from motorcycles to motorized scooters, could take advantage of the exception, and he said no. But the final call would be by a law enforcement officer who witnessed what was done. Gunnar also said a businessman with a view of the barrier from atop the large glass office building there tells him he occasionally sees cars squeeze through the crosswalk gaps in the barrier. That, of course, is illegal. And Jim Hockstein writes, “I don’t recall voting (or even asking for) eliminating parking on Fourth and Fifth, nor that traffic barrier on Warren between Fifth and Burwell. The out basket: Fourth and Fifth will remain two-way streets when the work is completed, says Gunnar Fridriksson of the Bremerton city street engineers. The work is part of the renovation of Kiwanis Park, which lies between the two streets. The work in the streets is creating what are called bulb-outs to slow traffic and give pedestrians a shorter distance to get to the other side of the street. City Parks Director Wyn Birkenthal said many drivers use Fourth and Fifth to avoid using arterials Burwell and Sixth, which have traffic signals, creating safety problems. There will be three pairs of bulb-outs across the street from one another on Fifth Street, at the intersections with crosswalks, and three on just the park side of Fourth Street. Around 40 back-in angle parking spaces will lie between the Fourth Street bulb-outs. Gunnar said, “Overall, we are actually increasing the number of parking spots with the projects. We are introducing angled back-in parking along Fourth Street along the park.” Spaces on Fourth Stret will increase from 111 to 125. “The bulb-outs at the intersections will not eliminate any parking, as with state law, vehicles are to not park within 30 feet of an intersection. The mid-block bulb-outs will eliminate some parking, I believe about four spaces per block on both sides of the street,” he said. Street projects don’t require a vote, of course. The tops of the various bulb-outs will be a mixture of hard caps and rain gardens with landscaping, Gunnar said. The ones on Warren Avenue will be hard surface. Wyn filled me in on what the park will look like when the work is finished. It will still have a soccer field on its high end, with improved irrigation. New restrooms have been built near where the old ones were demolished. The lower level will be much different, with the decrepit tennis courts removed and no backstop for ball games. The children’s play area, formerly on the upper level, will be on the lower level about where the ball field used to be, with separate areas for pre-schoolers and those six to 12 years old. An open lawn area will occupy the center of the lower area. Drainage will be improved to keep the lower area playable. There will be a picnic shelter and post and rail perimeter fencing in place of the “ratty chain link fencing” there before, Wyn said. It will be “low impact development, to minimize runoff. The walking trial will be pervious asphalt. The work will be comnplete by February, but the public will have to stay off the grass for an unknown length of time to let it establish itself, Wyn said. The in basket: I was putting along eastbound on Fifth Street in Bremerton recently when my wife in the passenger seat noticed that I had given no indication that I had seen a stop sign at Veneta Avenue. “Stop sign,” she said, and it was a good thing. I had not seen it and was surprised it was there. It was new. How new I didn’t know. Had I been running it and its mate on the other side of the intersection, or had I just not been on Fifth Street for a long time? There were no orange flags or signs indicating a change in traffic control. Thusly moved to curiosity, I wondered a couple blocks later at Chester Avenue about the traffic calming island put in the middle of the intersection a couple years ago. Traffic was light and turning left in front of the island would have been easier than going around it to turn left. I wondered if that would be legal. The out basket: Gunnar Fridriksson of the city engineers said he’d been curious about the four-way stop created at Fifth and Veneta himself, and learned that it was all done months ago in response to a neighborhood petition. It seems like a good move, given all the foot traffic around the Catholic school and church there. signs and traffic revision signs were installed shortly thereafter,along with swapping the lenses in the flashing light from yellow to red. He and Lt. Pete Fisher of Bremerton police said it is not legal to turn in front of a traffic island, any more than it would be to turn left and not go around a roundabout . You have to go around. Gunnar asked that we use this as an opportunity to revisit another element of driving roundabouts. motorists coming across the (new) bridge are ignoring the Yield sign when entering the new Manette roundabout,” he said. “We would like to try and educate before going to enforcement,” he said. As I noted in a December Road Warrior, the construction of the roundabout in Manette has changed the rules for right of way at that end of the bridge. Drivers exiting the bridge in Manette no longer have the right of way over other traffic flows and must yield to anyone already in the roundabout. That’s the rule for all roundabouts. At the Fifth Street traffic circle, stop signs control the side street and drivers at the stop signs must yield to traffic on the through street.